Yves Klein’s electric blue artworks add a touch of avant-garde to the baroque interiors of Blenheim Palace, England, in an exhibition featuring over 50 of the French artist’s works. 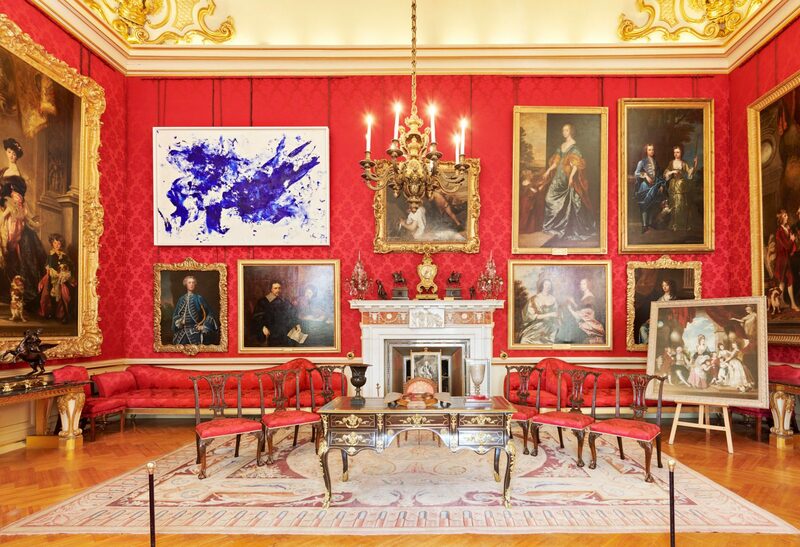 Organised by Blenheim Art Foundation in collaboration with the artist’s estate, Yves Klein at Blenheim Palace explores the concepts of beauty, sensibility and the sublime in the 20th century artist’s works. Visitors are given the opportunity to experience Klein’s contemporary paintings, sculptures and large-scale installations, juxtaposed against the ornate baroque decor of the UNESCO World Heritage listed eighteenth-century palace. This pigment became a significant part of his practice, and it was through the pure blue colour that he attempted to reach the “infinite” and “sublime”. The exhibition coincides with what would have been the artist’s 90th birthday, and also marks the fifth anniversary of Blenheim Art Foundation. “We are delighted to mark our fifth year by paying homage to Yves Klein, one of the most significant artists of the 20th century,” said director Michael Frahm. “This exhibition celebrates the universal sensibility of Yves Klein’s language and I hope it will touch visitors of all ages with its timeless, enduring and spiritual effect,” he continued. With over 50 of the artist’s works on display, including a large-scale blue pigment installation and a number of his Monochrome paintings, the exhibition is been billed as the most comprehensive to date in the UK. Klein’s performative Anthropometry works painted with “living brushes” – models whose bodies were coated in paint and used to make marks onto canvas or paper – hang among the 18th century family portraits of aristocratic subjects in the Red Drawing Room. The exhibition also sees the artist’s large installation of loose, blue pigment stretched out like a “desert landscape” or a “lunar ground” across the palace’s Great Hall. Pigment Tables coloured with IKB, gold and pink are displayed in the 3rd State Room, while Relief Portraits of the artist Arman and poet Claude Pascal – Klein’s childhood friends – are on show in the Long Library. Klein’s blue pigment continues to influence artists and designers around the world. Swedish-Chilean designer Anton Alvarez created a series of tall vessels coated in the vibrant blue tone, and Brussels-based architect Olivier Dweka designed a modernist home inspired by Klein’s paintings. Photographs is by Tom Lindboe.